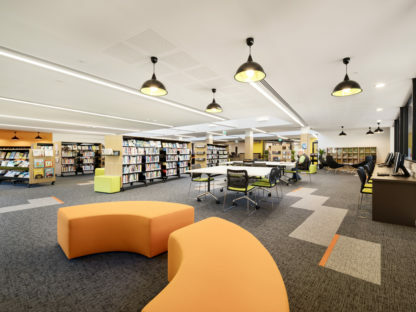 The project provides a strong identity for the Visual Arts, with tailor-made learning areas and workspaces centred around a presentation focus space. Specialised teaching spaces incorporated a general studio, print, photography and drawing studios, individual student studio spaces and various storeroom and student locker areas. Specific requirements for the visual arts have been designed into flexible learning areas that service both this and a range of other pedagogues. The existing building shell is retained and the interior completely reworked to provide the educational needs of the user groups. Delivered over two stages, KATZ provided full service including management of the building contract as superintendent.